Dakota says that she and her friends are excited to talk about the Best Dog Food Treats. She says her favorite treats to do tricks for are the crunchy treats. When she wants to relax however, she prefers to have a rawhide to chew on. Do You Want The BEST Dog Food Treat? Dakota says between her and her friends they have tried all sorts of different dog treats. So, she wants to share with you what they think are their favorite kinds of treats. Let’s review what makes each of these types of the best dog food treats outstanding. When it comes to crunchy dog food treats there are many biscuits and baked options to look at. Many companies offer options in a meat flavor, but they also often offer options in fruit options like apples or mixed berries. There are also chewable treats for any dogs who prefer a softer treat or who don’t have strong teeth. Canned dog food treats are available for dogs who have trouble eating regular treats. Jerkies and rawhides are two other options for treats. Jerkies come in meat flavors such as chicken, beef, sausage, bison, and others. Rawhides are a good option for dogs that have a need to chew. Rawhides can keep a dog busy for a few minutes to an hour. One of the downsides to rawhide treats is that not many are made in the USA. Some companies outsource the production of their product to China. To assure your rawhide is fresher and healthier for your dog, buy rawhide treats from the USA and make sure it has a larger thickness. So, if you have concerns that rawhide treats are not good for your dog, there are alternative long term chews for your dog to try. You can look for bully sticks or beef tracheas. The most important thing to remember when giving your dog treats is that some things we may find delicious, dogs may not find very appealing. Human foods can even be dangerous for your dog to consume. Another good rule of thumb when it comes to buying the best dog food treats is to only buy treats whose main ingredients you can pronounce. These are good examples of ingredients to keep in mind when buying dog treats for your companion. The best ingredients to look for are any products with a protein or produce base. There are many different ingredients to watch out for when looking for dog treats. One thing to avoid is fish based treats. Fish carry levels of mercury that can be harmful to dogs. Milk based products are another thing to avoid. It is not uncommon for dogs to be lactose intolerant so any milk based products could cause problems for their digestive system. Something else to look out for in dog treats are treats with a liver base. Liver treats have a high amount of toxins. If you still worry about the safety of your treats, buy organic, all natural, or grain free treats. These types of treats are not only safer, but they also provide a way to maintain a healthier diet for your best friend. One of the most important safety precautions you can take is to avoid buying treats from countries like China. Pet jerky treats also had problems when made in China. Buying your treats in the USA is a good start to knowing your treats will be safe. Dakota says there are many different options of healthy dog food treats. She says to pick the dog treats that best benefit your dog’s needs when looking for the best dog food treats. Some of the options available are gluten free, all natural organic, low-fat, and dental health. Most natural, organic, or gluten free treats will state it on the front. If they do not, look on the back at the ingredient list. For natural organic treats, look for ingredients that you recognize. If you cannot pronounce some of the ingredients, it is likely that they are not natural. For gluten free treats, look for any grains such as wheat or rye. Some treats will list if they contain any gluten, soy, or milk products. When looking for low-fat treats, look for a fat content with less than ten percent fat. There are also dental treats that companies design to help freshen your dog’s breath. These treats come in meat and minty flavors. Many companies offer them as either a chewable treat or a bone shape. If you are using these treats to treat bad breath in your dog, make sure that there isn’t an underlying cause to bad breath like gum disease. Dakota says when looking for the right treat for your dog, to take into consideration what health requirements they have. Talk to your vet about what your dog may need out of a dog treat. Decide if your dog is happier with soft, hard or chew like treats. Look into what treats might benefit their health. Each dog is individual so their treat needs will be individual as well. Dakota says there are so many good dog food treats out there! Since there are so many options she will tell you about the best dog food treats there are for each kind that is available. Below Dakota chooses the best dog food treats for crunchy, soft, rawhide, jerky, and dental health treats. Wellness has a motto stating that their main goal when creating their products is to create a natural product to help your pet live a longer, healthier, and happier life. They sell many different flavors and styles of these treats with flavors like chicken and cheddar, crunch peanuts and honey, lamb and apples, and many more. They also have treats for different sized and aged dogs. 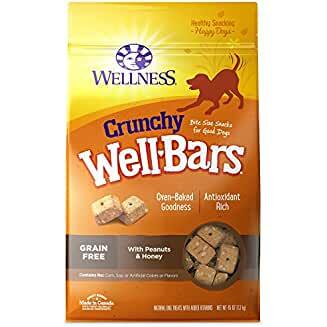 Wellness WellBars Crunch Dog Treats are grain free and made with natural ingredients. This specific Wellness bar has the flavor of yogurt, apples, and bananas. Also, the three main ingredients in this dog treat are peas, chickpeas, and potatoes. This treat has 12% protein, 8% fat, 3.5% fiber, and it contains Vitamin A and E. So, since it has a fat content under 10%, you can consider these to be low fat. Wellness makes these treats in the USA, specifically in Massachusetts. In addition, Wellness labels these treats with a bite size for all sized dogs. Cloud Star started by making their first batch in a home kitchen. It originated for the purpose of finding a treat for a German Shepherd who had food allergies. They have expanded to cater to dogs with different needs and have kept nutritional needs a top priority in their treats. While Cloud Star prides themselves on using ingredients like peanut butter, chickpeas, and flaxseed. They do not include corn, by-products, soy, or unnatural colors or flavors in their treats. Cloud Star offers many other types of treats besides their soft chew options. 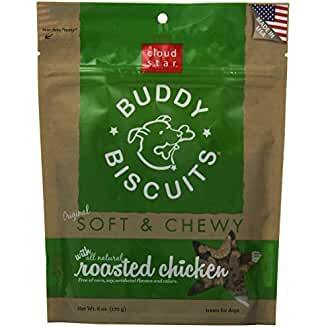 Cloud Star Soft & Chewy Buddy Biscuits Dog Treats come in many different flavors and have options for grain free, joint health, and training treats. The flavors they offer are peanut butter, grilled beef, roasted chicken, and bacon and cheese. The top three ingredients for the roasted chicken flavor treats are chicken, unbleached wheat flour, and tapioca starch. These treats have 10% protein, 5% fat, 5% fiber, and 30% moisture. You can consider these to be low fat since the fat content is less than 10%. Cloud Star also makes their treats in the USA. They label these treats as easy to chew and they have a fun gingerbread man shape. Lucky’s main goal when creating their treats is to create a safe and healthy option for your dog. They guarantee the safety of their product for your dog and promise the taste is better than other brands of dog treats. Lucky Premium Treats is located in Atlanta, GA and named their company after their dog, Lucky. 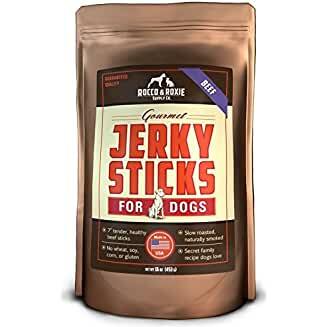 They got into creating rawhide treats because they wanted to create a treat they helps satisfy your dog’s need to chew as well as help relieve stress and anxiety for your dog. Lucky prides themselves on not using any preservatives, additives, or grains. 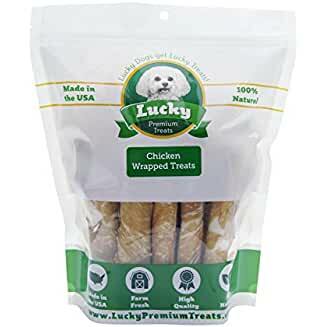 Lucky Premium Chicken Wrapped Natural Dog Treats are made in the USA and are a thicker roll of beef hide. Exactly what we are looking for in a rawhide. They make these dog treats out of beef hide and wrap them in chicken breast, which are the only two ingredients in the dog treat. They also make these dog treats from USA premium ingredients with 98% fat free chicken breast. Lucky also sells a smaller and a larger sized version of these rawhide treats to cater to all sized dogs. These Rocco & Roxie Gourmet treats are the highest rated dog treat Dakota has come across with a 5 star rating from over 2000 customers. Rocco & Roxie is family owned and operated and made in the USA. They strive to make treats that your dog will love and they guarantee that their treats will become your favorite choice. Rocco & Roxie test their treats on dog before selling to guarantee that dogs will love their products. They recommend when receiving your first bag to smell them and feel them to truly understand how good the flavor is and how natural it feels. Rocco & Roxie Gourmet Jerky Dog Treats come in three different flavors: beef, chicken, and turkey. They cook the beef for these tasty treats by slow smoking them for 15 hours. And, they list these treats as having high protein and low calories. They come in 7 inch strips but can be broken into pieces for smaller dogs. They make them with no wheat, soy, gluten, or corn. Milk Bone started out creating dog snack in 1908 at a company called Bennet Biscuit Company. Bennett Biscuit was a bakery located in New York City. Milk Bone claims to be the first dog biscuit treat made in the USA and they began expanding to have more sizes, flavors, and treats. They offer 20 different varieties of treats to choose from. The brushing chew is available in three different sizes: mini, small/medium, and large. 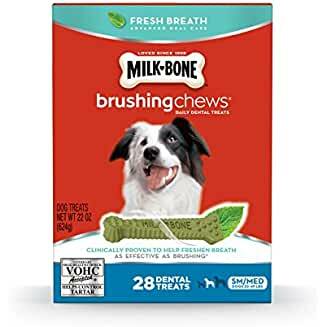 Milk-Bone Brushing Chew Dog Treats are listed to help control tartar and help freshen breath. The first three ingredients in this dog treat are rice, powdered cellulose, and chicken by-product meal. Although these ingredients are not the most organic options, the VOHC approves this dog treat. That means that the veterinary oral health council has approved this dog treat for freshening breath and controlling tartar. This treat contains 12% protein, 1% fat, 8% fiber, and 18% moisture. You can consider this a really low fat treat since this dog treat has 1% fat. It comes in a chicken flavor and has a twisted design to reach all parts of the dog’s mouth to clean the teeth and gum-line. There are many categories of dog food treats including crunchy, soft, rawhide, jerky, and dental health treats. Dakota says to make sure that you choose a treat that has the best ingredients. Also, make sure that you buy your treat from a reputable source. As we discussed, more and more reports are coming out that products coming from China do not always have the ingredients they say they have. We hope you enjoyed our article as much as we enjoyed researching this article. Dakota says sit, down, roll over… I’ll do whatever it takes to get the Best Dog Food Treats! High Calorie Dog Food: Is It Safe? Disclaimer: We do not claim to have any medical animal training. The content on this website should not replace licensed professional veterinary advice. Our information is provided based on our own internet research. All information provided on www.dakotasays.net should be verified on your own. Please consult with a licensed professional veterinarian before using any information found on this site. The views and opinions expressed in the articles posted here are presented in good faith and are strictly our own opinions. Accordingly, we promise to make every effort to be fair, accurate and truthful. However, comments posted at the end of each article represent the advice, reports and opinions of our readers. So, we cannot ensure the accuracy of or be held responsible for their content. Disclosure: We may earn affiliate commissions at no cost to you from some links on this page. This did not affect our assessment of products. Read more here and find our full disclaimer here..